Bioplast is a fantastic material for piercings and I’m pleased to announce a brand new range of Bioplast eyebrow bars. 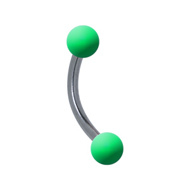 These eyebrow bars feature flexible Bioplast bars with polished silver ends. They combine the comfort of Bioplast with stylish designs and a lovely bright shine. The best thing about these Bioplast eyebrow bars is how very different they look in your piercing compared to traditional eyebrow jewellery. 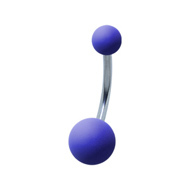 The Bioplast stem is hidden inside your piercing and the silver ends come in a great choice of cool designs. Bioplast body jewellery is a great way to ensure that your piercings stay healthy and happy. It is a biocompatible plastic that does not react when in contact with your skin. This means that Bioplast is completely non-irritating and does not cause soreness or irritation in even hard to heal piercings. 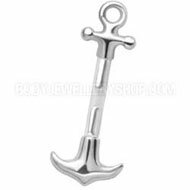 It can shorten piercing healing times and is recommended for piercings that have become aggravated. If your eyebrow piercing has become sore after wearing cheap jewellery, a Bioplast bar is a great way to give it a ‘break’. 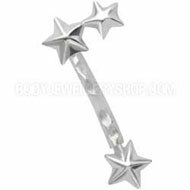 This entry was posted in BioFlex Body Jewellery, Eyebrow Piercings and tagged Bioplast Body Jewellery, Eyebrow Barbells, Eyebrow Bars on March 20, 2012 by Piercing Guru.